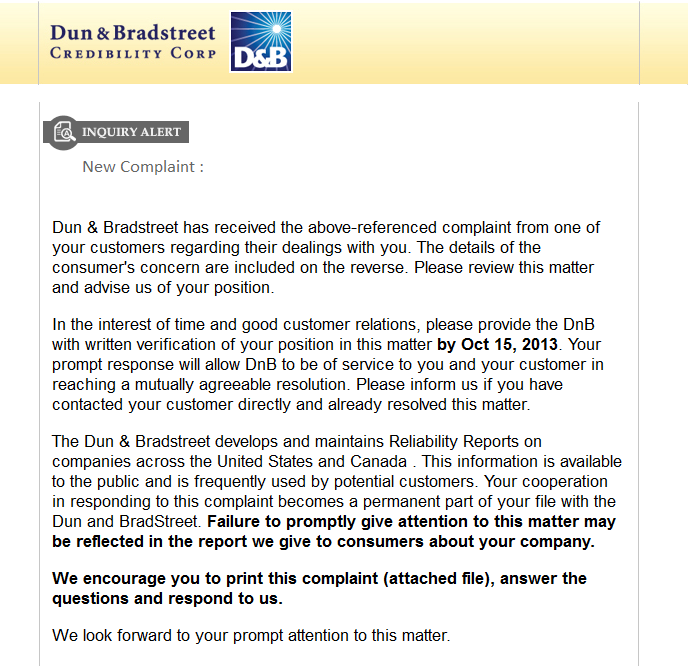 PhishingPier: Fake DNB Complaint - Malware "DNB complaint"
Dun & Bradstreet has received the above-referenced complaint from one of your customers regarding their dealings with you. The details of the consumer's concern are included on the reverse. Please review this matter and advise us of your position. In the interest of time and good customer relations, please provide the DnB with written verification of your position in this matter by Oct 15, 2013. Your prompt response will allow DnB to be of service to you and your customer in reaching a mutually agreeable resolution. Please inform us if you have contacted your customer directly and already resolved this matter.